After a discussion on the WordPress Answers Stack Exchange yesterday, I thought it would be a good idea to explain the different ways you can develop plugins for WordPress. Since the official plugin repository uses Subversion for version control, that’s the obvious first choice when you’re just starting your development stack. So here is, step-by-step, a tutorial on how to get started using Subversion to track changes in and eventually publish your WordPress plugin. The very first step is to create an account on WordPress.org. You’ll use this account to control your plugin, post to the support forum, and edit the Codex. Chances are that you already have an account. But if you don’t, it would be a good idea to create one. Next, you’ll need to ask the WordPress.org team to host your snazzy new plugin. All you need at this point is a name and an idea. It can take anywhere from an hour to a few days to get your application approved, so don’t worry if you don’t have any code written yet. Using version control is the first lesson every developer should learn, unfortunately it’s often a lesson learned through painful experience when something goes wrong. Let me tell you this, being able to “undo” a bunch of changes you’ve made over several folders is an ability worth its weight in gold – assuming it weighed the same as a 600-lb gorilla. If you haven’t used version control yet, you should start. Now. Right now. Which is convenient, because we’re going to! If you haven’t done so already, download TortoiseSVN. It’s a Windows GUI for Subversion that allows you to do all the fancy version control you need to without ever having to touch the command line. Purists might tell you to start with the command line first, but I know how intimidating that can be … so we’ll start with the easy-to-use GUI instead. Unfortunately, I don’t have a Mac, so I can’t give you screenshots or a guided walkthrough of a commit process. However, I have it on good authority that SCPlugin provides the same functionality with a very similar UI. The pictures won’t look the same, but you should be able to follow the same steps as outlined below. Let’s say your plugin application has been approved and you’ve finally received the “go ahead and get started” email from the WordPress team. Great! Find a place on your computer where you want to keep your plugin, and create a new folder for it – I keep most of my stuff inside a “/WP-Plugins” folder. Now you’ll have an empty repository ready and waiting for your plugin. If you open the folder, you’ll see three sub-folders: branches, tags, and trunk. We’re going to do all of our development in trunk. If you’ve already got your plugin ready to go, great! It’s actually easier to start using the repository for version control after you submit a first version. So let’s assume that you’ve finished your first beta release (version 0.1) and are ready to release it. You’ll be presented with the commit window. Enter “First commit of My Cool Plugin” for a commit message, select the checkbox next to each of the new files, and click OK. The WordPress.org plugin repository uses version tags to control everything. Basically, the engine looks at the readme file in /trunk, reads the “stable tag” out of the file, then loads the rest of the plugin from that tag in the /tags folder. So until you tag your release, you haven’t really published your plugin. Right-click in the folder again and select “Branch/Tag” from the TortoiseSVN menu. This brings up the tag dialog window. The first line in the dialog should indicate that you’re in the /trunk folder (the last word in the URL should be “trunk.” In the “To URL:” field, change “trunk” to “tags/0.1” assuming you’re releasing version 0.1 of your plugin. Enter a commit message – along the lines of “Tagging version 0.1” – in the big box at the bottom and click OK.
A window will pop up explaining that you’ll need to switch to the new branch to work on it. Ignore this message, you won’t need to switch to anything. Now right-click in the folder one more time and select SVN Update from the TortoiseSVN menu. This will update your local /tags directory with the tag folder you’ve just created. That’s it. You’re done. Your plugin is published. But what comes next? From here on out, you can change anything you want in the /trunk directory and commit it except for the readme file. You can update the readme file, but do not change the “stable tag” reference until you’re ready to release! Update the “stable tag” reference in the readme file. Update the version number in your plugin’s main PHP file. TortoiseSVN will warn you about taging your local version that’s not a HEAD revision. 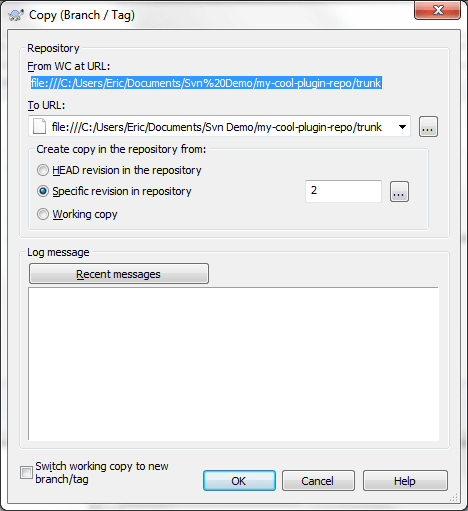 So to keep from making an out-of-sync branch, be sure to check the “Working copy” option in the “Create copy in the repository from:” section. Then tag as a new version just like you did with 0.1 above. This will create a new folder in the /tags folder for your new version and copy the latest changes you’ve made over to it. But you’re not done yet! Why Did We Tag First? Remember, the WordPress repository looks at the readme file to find the right version, then looks for that version in the /tags folder. By committing our tag before committing the changes in the readme file, we guarantee that the right version of the plugin will be there before WordPress needs it. Basically, you made sure /tags/0.2 existed before submitting a readme file that told WordPress to look for it. Thanks for the highly helpful tutorial. I just followed this to publish my first WP plugin and it was an absolute lifesaver! Short answer: yes. Contact me here with more information and I’ll get back to you. great stuff, could you point me to something on using DIFF to create fixes for plugins etc. Brilliant post. It helped me alot. I followed exactly the same steps as mentioned by you to update a new version of my plugin. But for some reason, no notification is send to existing plugin users nor the new version gets updated on the wordpress download plugin screen. But when you download the plugin, the latest tagged version is downloaded. I am really confused now. dont know what is going wrong. Can you please help me? Notifications aren’t supposed to go out. WordPress will automatically check with the repository twice per day to see if a new version is available. If there is (if the version in the repo is > the version on the site), it will alert the administrator and ask them to update. Really appreciate for taking out time and having a look at the plugin. I have emailed them and waiting for the response. But I guess I followed your document for updating the plugin. While uploading it for first time, I have followed some other document and it went wrong. Now for second plugin, I followed your document and everything seems to be perfect. Wish I had done the same before. Thanks alot for your help. Really appreciate.. I found out what mistake I was doing. The actual version shown on the download page is picked from main .php file of the plugin. So in the top we usually specify the version field. I was not updating that value and hence it was still showing the old version. Thank you so much for this useful WordPress SVN guide. This is the only place what I could find the complete details guide so far. I am having the weirdest issues and found your blog. i went through and now know we where doing things correctly…BUT..lol no luck. this is the error that KEEPS coming up after trying to checkout. any thoughts would be a lifesaver. Unfortunately no, I have no idea what’s going on. And to clarify, I actually wrote this tutorial using the same steps I follow on my Windows 7 box when I update plugins. And I’ve verified a few weeks ago that things are still working (for me at least) when I helped another developer update their system. Thanks for the tutorial. I’ve just published my first plugin: Simple Social Buttons. Your “how to” was very helpful for me. I find your post one of the most clear I found, and yet, there are so many steps! The screenshot Tag1.png shows in both “from” and “To” the same local trunk. And then you say “click in it again”, and I don’t know what you are refering to. Also, when I copy the whole folder or files from the trunk to a new tag (folder?) in the respository, there’s no command that works for copy/update/checkout the copied files to the local computer. I use RapidSVN, but I tried before with another applications and same issues. Once you are used to windows and folders, GUIs like these are not intuitive enough to make you feel like adopting it. Regarding the screenshot. That’s the dialog box that appears when you first right-click and then select “Branch/Tag.” You have to click the “To URL” field and edit it to change /trunk to /tags/0.1 (assuming you’re tagging version 0.1). If you’re tagging, try to avoid copying the entire /trunk directory anywhere. It has hidden /.svn folders inside it that Subversion uses to track individual file revisions. That’s why you’re having issued with the “This or that already versioned” message. If at all possible, use Subversion to create the tag rather than trying to move any directories or files yourself. It’s more efficient to use the GUI tools than to do it manually. I recommend TortoiseSVN because it integrates well with Windows and the regular directory structure and doesn’t require you to learn command line functions. This post has helped me alot. It has helped to add my First plugin in the wordpress plugin repository. Thanks a lot man. You can check it out here about my plugin – http://www.wordpress.org/extend/plugins/shortcode-collection/ Thanks once again man. Also the plugin was causing some fatal error. i just now corrected it. Fantastic Tutorial, thanks so much for the write up! I am very happy that you also included the Making Changes section at the bottom. I am having a weird issue and found your blog. I’m a little confused about submitting a plugin. I have two small plugins that I used for a few months, and I decided to give them to others. I tried a couple of times to send them but the only thing that I get is a email containing “This plugin will not be included.”. The plugins are: http://www.greatwpplugins.com/easy-post-subtitle/ and http://www.greatwpplugins.com/extra-category-content/. The plugin name is unique. I have no idea why they rejected my plugins. Thanks for this. Just what I needed as I set about the task of publishing my first plugin today! I have a problem… if you can shed some light, would be much appreciated. The part ‘From WC to URL’ it shows in your screenshot a file referenced on the C drive. When I get to this stage I only have http://plugins.svn.wordpress.org/….. and cannot select hard drive. I tried keeping it as the http but when pushing, it does create a folder version 1.0 but inside this folder, instead of the files it contains a duplicate – branches, tags, trunk. Anything obvious that might be going wrong? The following line “Right-click in the folder again”… i found i had to ensure i right clicked inside the trunk folder. The previous right click mentioned was in the master folder. I still had the reference to http and not C:// but it has seemed to work ok. I guess this is solved. Thanks for the reply. Yes, all working fine! Just wanted to say thank you for the fantastic guide! Had my first WordPress plugin approved and was kind of stuck how to set up svn on my home Windows PC and get it working properly, but your steps made it a breeze. Thank you Eric for this helpful tutorial; You made the scary SVN process a child’s play! It will ask you if you want to temporarily or permanently accept the “fishy” SSL. Type ‘p’ for permanent. 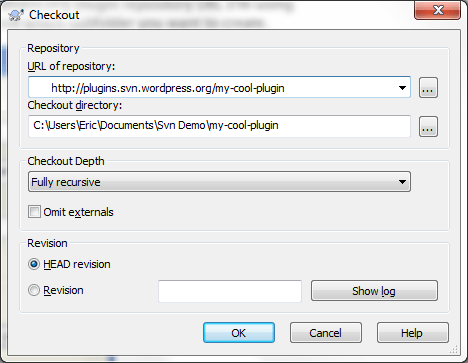 Then go back to the checkout process from the SCplugin menu and complete your data transfer as outlined in Eric’s post. I managed to get my file updated but I can’t anything to go into the local tags file. Something is missing from your instructions or I just don’t get it. Ahh.. I see you covered this above. Nevermind! You are missing a step in your “make changes” section – perhaps you meant to express it but it was not explicit enough for me (given I have made the same mistake multiple times now). In order to get all the version information lined up, you also have to update your version number in whatever your main php file is. Otherwise your current version on your wp.org/plugins screen (a.k.a Download version 0.2 etc.) won’t match your changelog and or readme.txt file. It’s annoying as heck to make a change only to find your forgot the grrrrr version number in the main program file. Thanks for the feedback. I’ve added the step so that it won’t get lost in the future. Thanks for posting this, I just follow the guideline step by step. I’ll definitely need to update the post with details about the header background. Thanks for the alert! Yeah, that will be cool. That can catch a few people up. Just remember, the commit message is the only way you (and the rest of the world) have to know why you made those particular changes when you come back 6 months later and look at the logs. I have tried this 50 times and can’t get it to work. When I put the plugin files into the folder they all have a blue question mark … then when I right-click and click commit it says “no files were changed or added since the last commit”. This is driving me up the wall … everyone else seems to be able to get it to work. Depressing. That’s entirely understandable. The problem is that the files are “unversioned.” Basically, Subversion doesn’t know they exist. There are two ways to “add” them to Subversion. 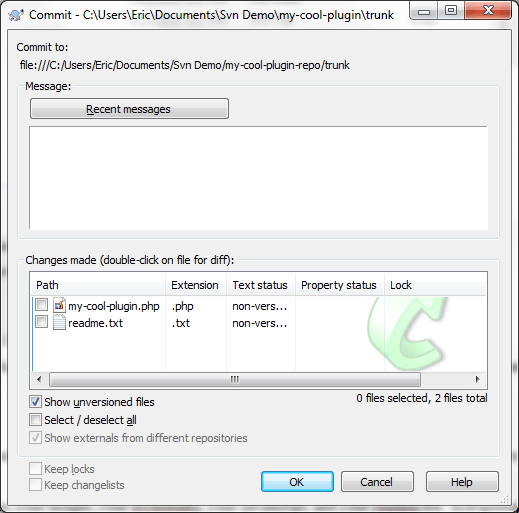 Way 1) Right click and select Commit like normal. Then, when you see the list of files in the commit window, right-click any that have a status of “non-versioned” and select “add” to add them to Subversion. Now when you commit they’ll be checked in. If there are a lot of files, you can right-click the files themselves in Explorer. From the Tortoise SVN context menu, select “Add” and they’ll be added to Subversion. From here, you can commit as per the regular instructions. Thanks for your reply eamann – I finally got the plugin uploaded and just can’t get the header banner to show. Have it in the assets folder and am getting a colleague to check out my repo. I wish you the best of luck! Having someone else take a look at your repository is the best way to make sure everything is in the correct location. My first attempt accidentally put /assets inside the /trunk directory … that won’t work, they need to be side-by-side. Thanks for the help on this one, I am a newbie to SVN. Finally got my first plugin published, BuddyPress Profile Tabs. The best tutorial I found for this specific task, I didn’t think I’d find any tutorials at all. Nerd props to you my friend. Thanks for a great walkthrough. Worked great for me except one idiot error I made. When TortoiseSVN prompted me to put my WordPress.org username and password. The username is case-sensitive. I’ve uploaded my first plugin, MU Plugins Tool. It allows you to selectively enable/disable any must-use plugins installed. This is really helpful article. I have submitted my first plugin. It also helps for beginners. I am certainly bookmarking this article for future reference. Thanks!! Thanks Eric! I’m used to git and didn’t feel like learning a new version control system just for this. This got me up and running right away. You might need to update your Subversion client, or you have some strange firewall rules configured on your machine. I just tried connecting to that same URL and things worked just fine. this awesome blog and works form me. now one more question is how can i change my plugin banner image? is there any idea?? this all information is so much useful for me. I was able to follow this tutorial to upload my first plugin today. Very smooth. Thanks. Thank you for your tutorial, it helps. Do you have any clue on why ? Without more context, no I don’t know what’s going on. I’d recommend checking StackOverflow or similar sites for that error message. Please how does one unpublish their plugin? How do we remove the old one with “pitchprint-web2print”? Send a message to plugins@wordpress.org and they can give you a hand. Thanks you so much for this helpful post. Especially, screenshots of “Tortoise”. That made it really easy to follow. thanks a million… really useful! Thanks for the help, I don’t update my plugin much but whenever I do I have to come back here to remind myself how to! I just wanted to say that I love this article. Since I had totally forgotten about Tortoise SVN… but your tutorial made updating the plugin a breeze! Thank you for taking the time to write this up. I’ve not used SVN for quite a few years and this was the perfect refresher! Thanks, your guide helped me a lot in making my way through the complicated system of SVN. I just wanted to thank you. This post helps me alot. It clear all my hardships. I don’t update my plugin much but whenever I do I have to come back here to remind myself how to!